Google is grappling with an ongoing antitrust case in Europe over its online search business, and if its rivals have anything to do with it, that might extend into Google’s power in the mobile sphere, too. Figures out today from Kantar Worldpanel may not help Google’s case very much. The analysts say that in the last three months, Google-powered smartphones, running Android, accounted for more than 70% of sales in the region’s five biggest markets of Great Britain, Germany, France, Italy and Spain — part of a wider, global trend of Android continuing to consolidate its leadership position in smartphones. And the secondary story here is that much of this success is being led by Samsung, which now accounts for nearly half of all smartphones sold in the region. Although smartphone penetration is slowing down in developed markets like Europe, Android’s does not appear to be: that 70.4% of sales is nearly 10 percentage points higher than it was a year ago (61.3% in the three months that ended May 31, 2012). We are asking Kantar (a market research division of WPP) about what Google’s global share of smartphone sales is at the moment, but in March it was 64%; and with Android’s share rising in every market over the last few months, that will mean that this 64% share will be approaching 70% globally soon. A similar story is being played out in China, now the world’s biggest market for smartphones. There, Android has basically won the game (for now), with over 70% of all sales of smartphone devices accounted for by Google’s platform. It’s not clear from Kantar’s figures whether these are all official Android builds, or whether this figure also accounts for forked devices, which will not work with Google’s wider ecosystem of products like its app store, billing services, and advertising. (We’re asking and will update if/when we find out.) Ironically, the fact that there are such strong local players, producing smartphones catering for the Chinese audience, means that in any case Samsung does not dominate in China in the same way that it does for the rest of the global Android (and smartphone) landscape. 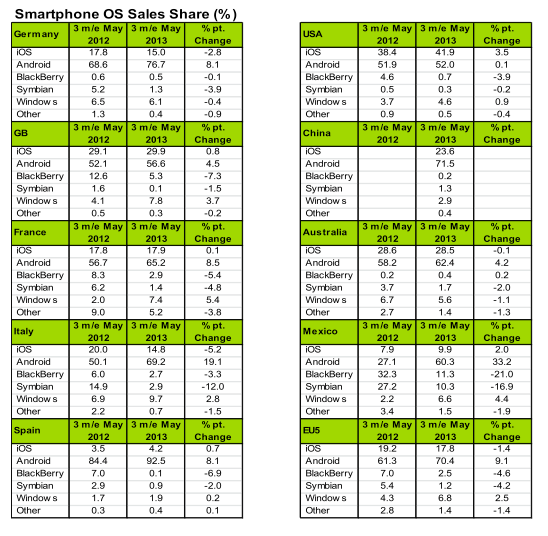 Interestingly, Kantar highlights that it’s not exactly plain sailing for Samsung in Europe, either — in the UK, for example, which now has a smartphone penetration of 65%, the new Xperia Z smartphone from Sony is putting in a strong performance, with 38% of Xperia purchasers being ex-Samsung owners, “the majority of whom have upgraded from the Galaxy S2,” writes Paul Moore, global director at Kantar Worldpanel ComTech. I’ll believe in a Sony resurgence when I really see it, though. One market is not enough to prove that, in my opinion. But it does point to another issue: whether Samsung has a strong enough brand to keep users sticking to it. Kantar notes that Samsung has the second-highest loyalty rate in Britain after Apple (59% versus 79%). One of Apple’s key factors is its strength across different consumer electronic hardware, specifically PCs — something highlighted last week by Gartner as well in some research across sales of the whole category of IT devices. In the U.S., Android has also pulled ahead, now accounting for more than half of all smartphone sales at 52% (compare that to 49.3% at the end of March). But Kantar points out that Apple’s relatively new relationship with T-Mobile has given it an extra push, and provided a counterbalance against the Android juggernaut. iOS sales grew by 3.5 percentage points, the most of any platform. Apple’s platform in all took 41.9% of sales in the U.S.
“Across Europe, Android growth remains strong. However, in the U.S. Apple’s expanded distribution agreement with T-Mobile is helping the iPhone keep Android growth at bay. T-Mobile is the smallest of the big four US carriers but it does have the capacity to give iOS a boost, particularly as 28% of its customers plan to buy an iPhone when they next upgrade,” writes Moore. For those who are tracking how the smaller players are faring: BlackBerry lost nearly 4 percentage points and is now down to just 0.7% of sales in the last three months — one kind of proof that its new push with BB10 is not giving it the sales bump it so crucially needs right now. In a market where it used to be the smartphone leader, BlackBerry is now selling almost as few as Symbian, a platform that has never done well in the U.S. and has now been discontinued by Nokia. Windows Phone, meanwhile, is respectably rising if still tiny compared to the big two — up 0.9 percentage points to 4.6%.